Once you have initially depicted the different contexts for your stakeholders, as described at Contexts, you will now be able to sort out the things that apply to a stakeholder while specifically found under a given context. Defining data sets that belong to (or are bound to) that stakeholder, are among these things you classify per context. Such data sets are depicted for the user experience as collections that are part of My stuff. 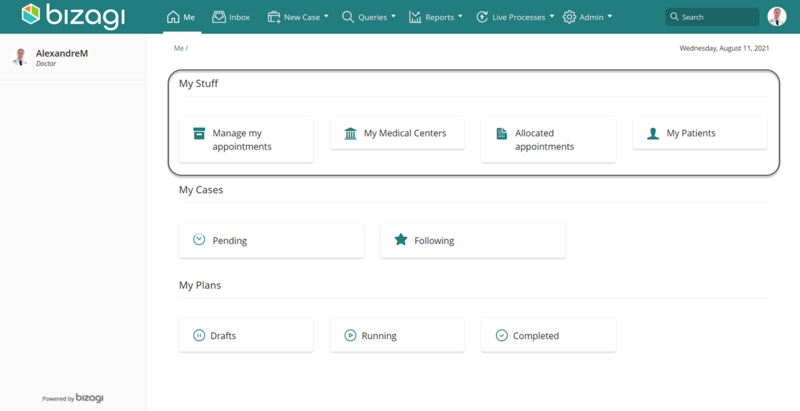 My stuff is designed as a section in the Work portal that presents in one place, all sets of information which are of interest to a stakeholder. And because Bizagi is context-aware, you could have different sets show up according to the context on which the stakeholder is in. •The working shifts which are scheduled for that nurse. •All the patients which are currently under his/her care. Before getting into detail about My stuff configuration, consider that collections in Bizagi are now classified into 2 different types: Direct collections and Indirect collections. Direct collections are one-to-many relationships which are created explicitly in the data model. If you were familiar with previous versions, then nothing has changed regarding such collections, and these are both still useful and especially required from the processes' perspective (e.g, to display tables with rows of information inside of activity forms). Usually when there is an ownership concept involved (e.g a Customer has many registered phone numbers), then a direct collection is appropriate. 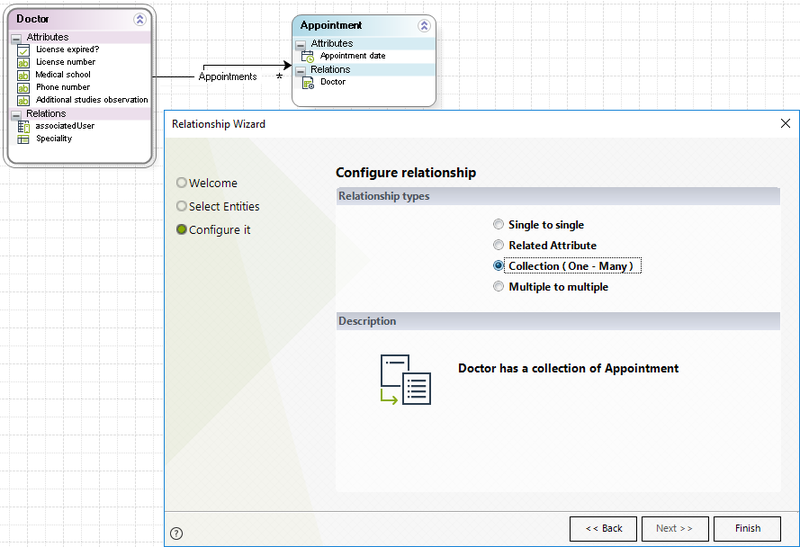 Though you may create new direct collections in this section, recall that you may also create them by editing the stakeholder entity (when defining or modifying the stakeholder) in the Experience design, or at the Process view or Expert view, just as part of steps involved in the design of your data model. Indirect collections are Xpath definitions, which also support one-to-many navigation but without necessarily implying the concept of "ownership" between the 2 entities involved. Instead, these are more focused on providing a shortcut for the stakeholder to access certain information which is relevant for him/her at the time (i.e, this means that such collection could hold information which is only useful temporarily). 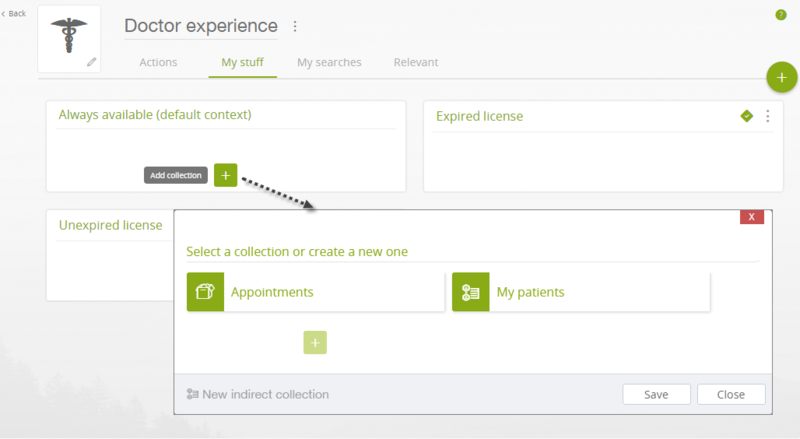 The difference when compared to a direct collection is that indirect collections are a new concept within Experience design, that leverages the use of My stuff section because these are especially designed to feature quick/easy access to relevant data which a stakeholder needs for follow-up tasks. 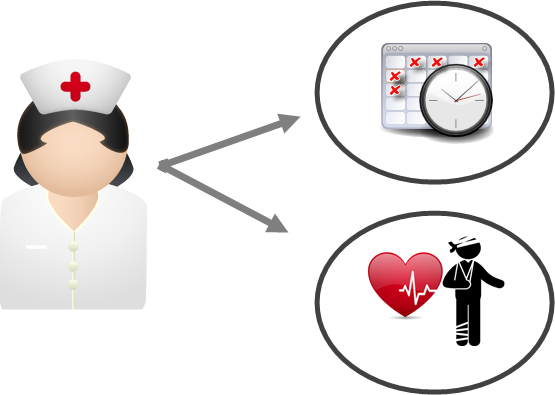 For example, a Doctor or Nurse stakeholder may rely on indirect collections to easily access the list of patients currently under his/her care. •Allows design-time filters, so that you can display multiple sets while being linked to the same collection. For example, using different filters to display separately: the complete list of patients I am attending, the list of critical patients I am attending, and the list of non-critical patients I am attending. Note that records belonging to these sets may show up in more that one collection, and that there is an important notion regarding temporarily useful information with indirect collections, in which you will need to make sure you have attributes (i.e Boolean) to filter if patients are critical or non-critical, and currently under care or no longer under care. •Support and optimize access to multiple records when navigation is more than 1 entity away (as long as you can navigate to that collection via Xpath). In order to define collections which should be part of My stuff for each context, hover on that context and use the icon to include a new one, while in the My Stuff tab. 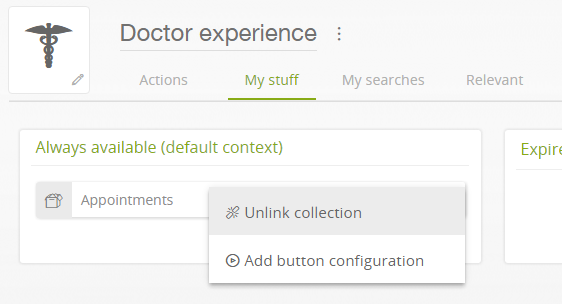 Click on the name of the collection you want to include, from the listed direct and indirect collections so that its icon highlights in green, and click Save. Direct collections are represented with the small box icon. Indirect collections are represented with the linked entity icon. 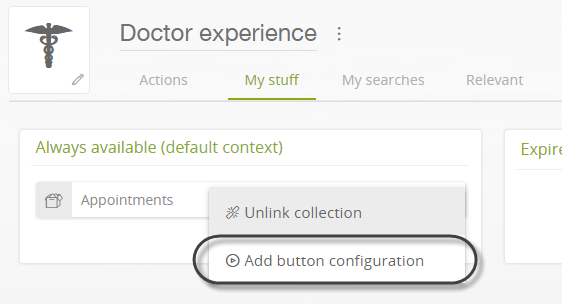 Alternatively, at this point you may click the icon to define a new direct collection or click on New indirect collection button to define a new indirect collection. For more information about creating indirect collections, refer to the Creating indirect collections. •Click on Select entity to choose from the drop-down list, an entity of your data model so that you can create a direct collection by specifying its name at Collection name. •Click Use an existing attribute to choose an reference type attribute in another Entity which points directly to this stakeholder. This way, Bizagi will create the collection by reusing that reference attribute as the many-to-one attribute. If you need to define a new entity to create the relationship with, click the Stakeholder's edit button and create a new collection. Then, relate it in My Stuff using the instructions above. 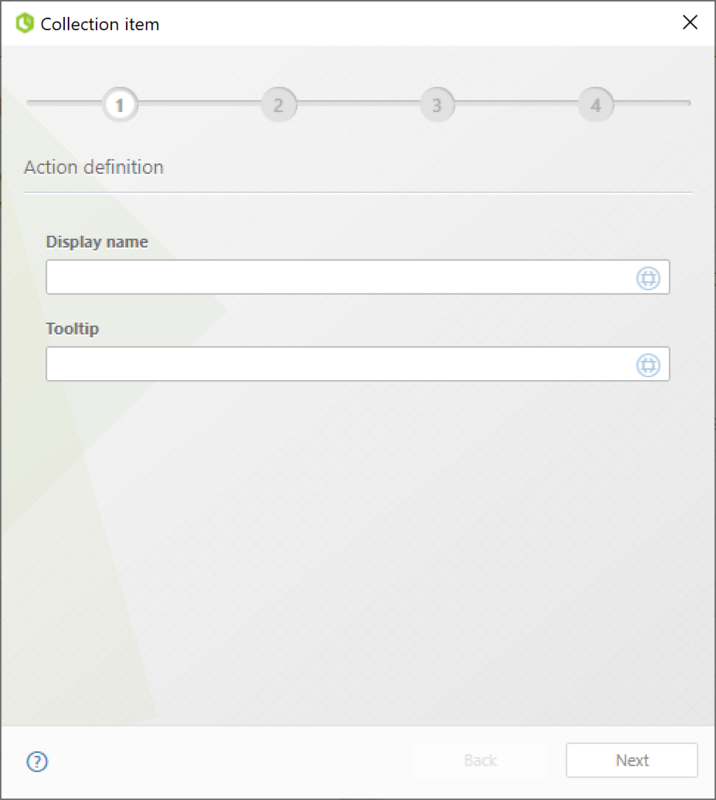 Consider the following aspects which you can configure when choosing not to use the default configuration for My stuff. When viewing My stuff and all the records which belong to (or are bound to) that stakeholder's collection, you may enable the possibility for that stakeholder to create new records in that collection. For this, hover over the icon on the right ( ) and then, click on Add button configuration option (alternatively, you may do this using the Stakeholder entities options presented in the Expert view). This option will open the Add Collection item wizard in order to crate the button to create items for this collection. By default, Bizagi uses a basic template to display information of records in My stuff. Such template uses random attributes of the entity of that collection represented in My stuff. You may choose to define your own data templates to display information, be it for list of records (referred to as List type templates), or when viewing one specific record (referred to as Content type template). For more information on how to do this, refer to Data templates. Nurse icon taken from http://dapinographics.com/projects/medical-icon-set/.